Great Southeast Flooring America is a CCA Global member that has been in the same family since 1979. In 2014 President Nelson Green attended a trade show in Dallas for CCA Global members and saw a Watchfire sign demonstration. They had been spending a great deal promoting the store through local advertising, and Green immediately recognized that he could save money and control his advertising better with an outdoor digital sign. Ready to take the next step for his business, Green worked with Watchfire to have an onsite demonstration so he could see an LED sign in use at his store in Melbourne, FL. A few days later, with designs and a quote from Watchfire dealer partner Mid-Florida Signs and Graphics, Green placed the order for his new 12mm LED sign. 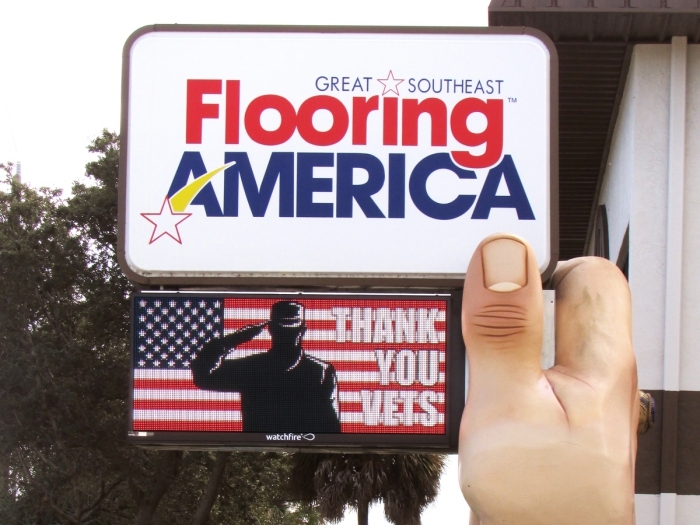 Great Southeast Flooring America is known as "the store where friends send friends," and they do a great job of using the LED sign to promote specials, customer loyalty programs and additional services like floor care and cleaning. Green adds, "Sales did increase from the very first month. The sign is great."